Our September 2013 issue has two focuses. First is Honoring the Fallen. The second is Keeping Yourself Safe. For the first, At the Ready Magazine is hosting a tee shirt fundraiser. 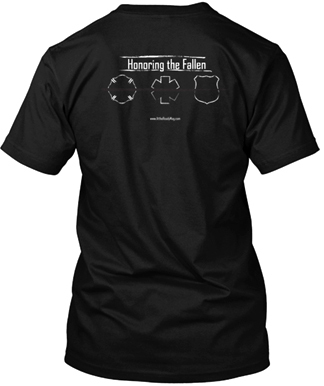 $10.00 from every shirt sold will be donated, split between the three non-profit organizations; the National Fallen Firefighters Foundation, the National Law Enforcement Officer Memorial Foundation, and the National EMS Memorial Service. The shirt design represents two things, one is quiet honor, and the other is a sense of community. The three white symbols; Maltese Cross, Star of Life, and Badge are instantly recognizable as representing our public safety heroes, paid or volunteer, active or retired. The single black line demonstrates community. It runs continuously through all three symbols because when one agency or community has a loss, all of us are affected. This shirt can and should be worn by anyone who appreciates first responders. The shirts are $20.00, and available in 5 colors, though we show it in black. Order yours now and it will be received during September, when our issue is released. Be safe out there always. Stay At the Ready.